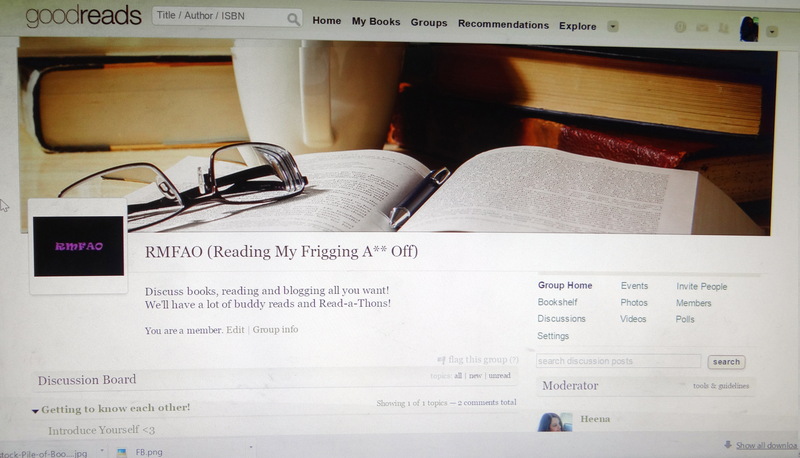 I’ve created my first group on Goodreads: RMFAO (Reading My Frigging A** Off). Isn’t the name amazeballs! I’m really, really excited and would love to invite you all to join it. I’m planning to have a lot of buddy-reads and a hell loads of Read-a-Thons! I’ll be posting about them here, on The Reading Bud as well so that whoever is not on Goodreads (which I highly doubt!) won’t miss out on anything fun. It is amazeballs! 🙂 Awesome name! I understand, even I keep myself restricted when it comes to groups. It sure takes a lot of time. You’re not going to believe this, but I haven’t investigated Goodreads yet – it’s on my neverending to-do list! OMG, you kidding! I’d strongly recommend you to join it. It’s the best books site ever!